Alignment has a relatively large impact on the readability of a text. Four types of alignment can be identified: left alignment, right alignment, justified and centred. Western society (i.e. those who are used to reading and writing from left to right) will intuitively prefer left aligned texts above (fully) justified ones. Justification. In justified texts, both the left and the right hand side are straight. Justification radiates a sense of order, discipline and tradition. It is characteristic of newspaper layout which separates columns visually from each other. The potential dangers are evident on a line ending with a long word, ugly gaps may occur between the words, inevitably compelling word hyphenation. Left alignment. Left-aligned (‘left-flushed’) texts are characterised by a ragged right paragraph structure. They are much more natural than justified texts. Word spaces are consistent with the font design. Only in the twentieth century did this printing style become customary (before that, it was rarely used, probably because typesetters considered justification as a proof of their printing skills). In contracts, the sections and subsections should either left-align or be justified. In European style contracts, the article headings are left aligned (or, with no particular additional effect, justified). 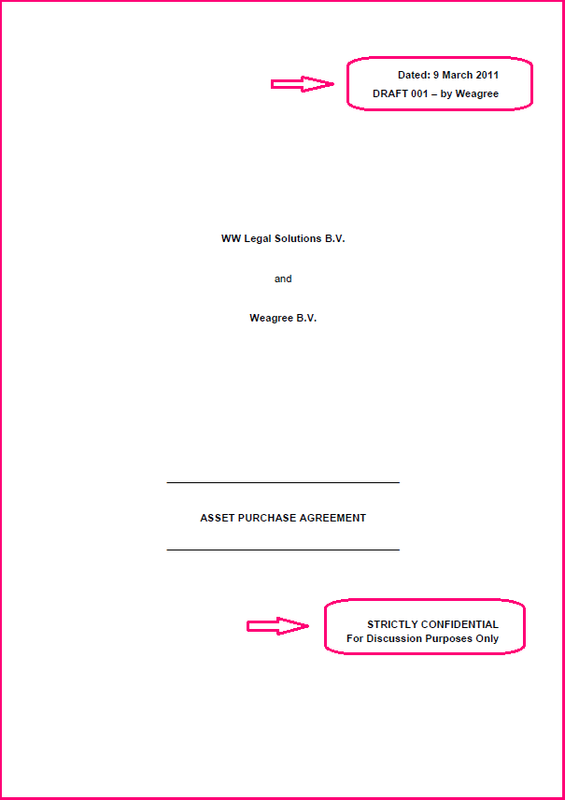 In U.S. style contracts, the article headings are often centred. Centred & right-aligned. Normally, centred texts are only used for cover pages, for headers and footers, and for headings of schedules or annexes. Right alignment is only desirable in very short eye catchers: confidentiality markers or contract date and version identifiers. Whilst the reader will likely catch the two or three right-aligned marking words, he or she will probably completely miss messages consisting of more than just a few words. See the marked text blocks in the example.